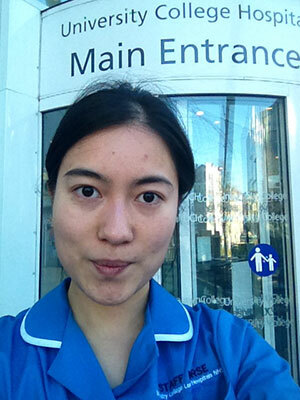 Alisa recently graduated from City University London as an Adult Nurse, now she's working at a major London hospital. Hi, my name is Alisa and I recently qualified from City University London as an Adult Nurse. I'm now working at University College London Hospital in the haematology department. City is a great place to train and has prepared me for life as a working nurse. The University has state-of-the-art clinical skills labs, complete with life-like mannequins which simulate both acute and chronic patient scenarios, these facilities are fundamental in preparing us to embark on real wards. All the lecturers are very approachable and respond promptly to our emails. We are all assigned a personal tutor at the beginning of the course to provide us with support on any personal or academic issues. I chose City because of its affiliation with leading teaching hospitals in London; UCLH, Barts and the London and Homerton. Every day I start my shift at 7.30 am, or 7.30pm if it's a night shift. At the start of the shift the nurse-in-charge briefs the team on which beds are available and any new patients expected to be admitted to help us liaise effectively with the bed manager during the day. Then each patient is discussed so we know their presenting diagnosis, any major changes that had occurred and their care-plan etc. Initially it was so daunting; due to the time constraint of handovers I felt a bit overwhelmed, especially with medical abbreviations and jargon, but I realised that, if I was to survive on this ward I had to be proactive with my learning. I invested time and effort to really look up and understand what the common medical terms meant and their implications for the patient. What I find especially rewarding about being a haematology nurse, is the amount of autonomy and higher technical skills that we are expected to provide to our patients. Haematology patients encompass blood malignancies such as leukaemia, lymphoma and multiple myeloma. Blood cancers can progress quickly and often the healthy blood cells are depleted so it is important that we check and interpret the daily blood results carefully and make the relevant recommendations to the doctors. For example, if the patient's platelet count is below 10 they would require a platelet transfusion. Platelets are components within the blood that are essential for clotting, if they remain low for too long patients are at risk of major bleeding or haemorrhages. As nurses, we have the responsibility to inform the doctors to prescribe a unit of platelets and subsequently, place the order for the blood product via the internal blood bank. I often feel under enormous pressure in my role, I have to anticipate for patient deterioration, provide emotional support to distressed patients and relatives, and using sound clinical decision making skills to prioritise my workload. However, all my colleagues are extremely approachable and supportive to me, so much so that they have become a second family to me. Nursing is more than just "wanting to help people" or "being a people-person". It is an art that requires time and experience to master. As part of the Nursing and Midwifery Council code of conduct for nurses we are expected to make sure that people's physical, social and psychological needs are assessed and responded to; sometimes this is easier said than done. I can never know for certain when someone will suddenly burst into tears or convulse violently in pain, which requires me to show compassion to a complete stranger, all the while being professional by maintaining their dignity. The vast majority of patients are a pleasure to work with, their general gratitude and understanding of me as a newly qualified nurse makes it all the more hard for me to see them suffer. The Golden rule of nursing is to treat all patients with unconditional respect by responding to their distress in a calm and professional manner. I've been qualified for two months now and although it can be super stressful, I keep bouncing back because nothing can replace the sense of personal satisfaction working here.